Several lights turn on and illuminate Special Agent Francis York Morgan as he stands in a peculiar patch of forest. Red leaves carpet the ground and directly ahead twin angels whisper feverishly to one another in ornate armchairs. There are several pieces of furniture and home appliances scattered throughout the area. Along the perimeter are couches, a fire place, TV, and a cluster of mannequins. Man what a strange place… this murder investigation has gotten off to a bizarre start! If you try and speak with either of the angels York is told to wait a moment so we might as well use the time to take a look around the area. 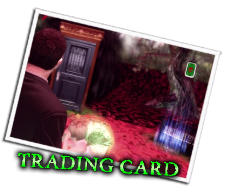 Directly behind the twin angels is your first Deadly Premonition Trading Card, [Trading Card No. 1 (Francis York Morgan)]. There are 65 trading cards hidden through out the town of Greenvale. There’s a card for each character you meet, the enemy types you encounter, and a few that memorialize some of unique items you will spy around town. Each time you collect a card York will earn a monetary bonus of $200! Collecting these cards is not necessary to complete the investigation but if you wish to finish every side mission finding each one is a top priority. This guide will point out where each card is located and how to collect them all as you go along through the Greenvale investigation. If you haven’t already completed the game do not read any of the card descriptions as many contain MAJOR plot spoilers. Make a circuit around the red room and observe everything with a patch of red sparkles in front of it. Once everything of note has been observed the angels will call for York’s attention and the case will finally begin! After York’s prompt for Zach to respond we witness the Agent’s rather eventful arrival to Greenvale. With his car totaled and engulfed in flames after the crash York has no choice but to hoof it the rest of the way into town. Grab the [Steel Pipe] leaning on the fence and the [Agent Honor (Red)] beside York’s burning vehicle. 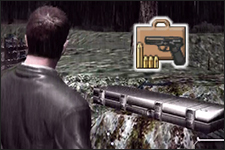 There are two types of Agent Honor in Deadly Premonition. 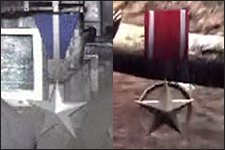 There’s the large [Agent Honor (Red)] worth $30 and a smaller [Agent Honor (Blue)] worth only $5. [Agent Honor (Blue)] is commonly found in excess around Greenvale by breaking fences/boxes and replaying Other World levels. Since the [Agent Honor (Red)] is a bit more uncommon I will make note of where and how many are found in each area in Greenvale. To the left of the burning wreckage there’s small hidden pathway you can access by breaking the fence down. Use the steel pipe to reveal the pathway the grab the [First Aid Kit (Small)] at the end of the path. You can continue to break fences in the area to pick up additional [Agent Honor (Blue)] if you wish and drop off any new items in your inventory into the tool box. York has a limited inventory space so the tool box is useful in storing any excess items or weapons the agent can’t keep on hand. When York’s inventory is full you can opt to place any newly found items in the toolbox so there’s no need to drop or use anything currently on your person to	make room and pick up a new item. Once an item is stored in the tool box it can only be retrieved again when you examine another toolbox in Greenvale. There’s lots of toolbox locations around town so it’s never much of a hassle to backtrack to one to recover an item into your inventory. Exit the crash site by following the path directly ahead and in the next clearing York will stop to profile the area and situation. After York’s dialogue concludes follow the path to the right as the path to the left leads directly to a dead end blocked by red vines. Profiling is Agent York’s method of piecing together all the clues found during the investigation of an “Other World” sequence of a particular area. Greenvale is a pretty friendly town but there will be moments when the landscape will turn into a nightmare and ghoulish enemies will attack. You’ll experience several Other World versions of a variety of Greenvale locations throughout the murder investigation and finding clues is necessary to exit the nightmarish situation. The number of clues you need to find will be indicated by the little key icons that appear on the bottom left of the screen. With every new clue found York’s profiling cinematic will repeat with less static and clearer images and he’ll also receive a small monetary bonus! The static-filled profiling sequences are a bit tedious to watch repeatedly so I suggest that you profile to get the monetary profiling bonus for finding a new clue but immediately hit the [Start] button to skip the cinematic. Save the profiling cinematic for when you have all the clues in possesion see what York has pieced together. After York rounds the corner with the dead dog he’ll spot a suspicious figure wander into a dark cabin off in the distance. Before you follow that figure inside continue past the door grab the [Agent Honor (Red)] by the red vines blocking the path ahead. The metal gate that leads out of the area is locked due to the lack of power and York, for some reason, doesn’t want to resort to brute force to try and get it open. This means our only option is the check that cabin out that that mysterious figure entered earlier. Inside the cabin the mysterious figure is no where to be seen. Pick up the [Can of Pickles] to the left on the shelf and examine the generator to turn the power back on and unlock the gate outside. What’s with the food items? In Deadly Premonition you not only have to worry about Agent York’s health you also have to keep an eye on how sleepy and hungry he gets during the investigation. In the inventory screen there’s life bars that represent York’s sleep and hunger statuses. When York’s hunger bar completely deplets and you neglect to feed him the agent’s health bar will begin to tick down until he collapses. This will result in an “Investigation Failure” and if you are milling around town it will also result in a trip to the hospital with a $180 fine. When York hasn’t had enough sleep he’ll lose his stamina and will be unable to run or target his gun for very long. York’s health doesn’t decrease but it sure makes getting from place to place or fighting enemies very tedious. So make sure York gets enough sleep and if he’s starving make sure to feed him! With the power restored York is immediately accosted by the mysterious figure we saw earlier. Shoot or hit the Shadow repeatedly until it dies and receive [Clue #1: Mysterious Shadow] for your efforts. Shadows, like the one killed mere moments ago, are dead bodies “possessed” by an evil spirit that crawl from purple oil slicks on the ground and on the walls. They may seem slow at first but will move quickly towards York to attack once they spot him. When Shadows are within grabbing range they will stick their arm down York’s throat and attempt to crawl inside him. This is an instant kill if you can’t shake them off quickly enough. 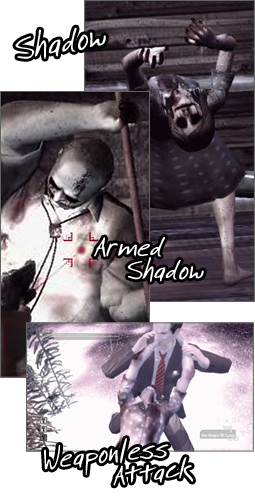 Unlike normal Shadows, Armed Shadows will attack York with their equipped weapon until he dies. Armed Shadows can take off more life then normal Shadows so it’s important to disarm them by shooting at their weapon until it is dropped. When weaponless the Armed Shadows will revert to the behavior of a normal Shadow. Strategy – Shadows are weak against fire and will die instantly if York shoots them while ablazed. If you shoot an exploding barrel near a large cluster of Shadows and they will all catch fire and quickly die. You can tell when an Armed Shadow intends to shoot by the by the glowing ball of light that appears at the end of their shotgun barrel. When you see this light quickly move to the side and shoot or hit the Shadow repeatably so they will drop their weapon without getting a shot off. When using a firearm be sure to aim for the Shadow’s head as multiple blows there will not only kill them faster but will also hinder their progress towards York and make grabbing him nearly impossible. Melee weapons are effective as well but it is easier for groups of Shadows to overwhelm you since you can’t keep at a distance while attacking. During the investigation Agent York will find clues that will help him in with his criminal profiling during the case. The more clues you find the clearer his profiling sequence of a certain area will become. The number of clues you need to find in an area is indicated by little key icons on the bottom left of the screen that appear shortly after York’s initial profile sequence. These clues are always found along the path you must take to progress though the Other World so overlooking a clue and having to backtrack will never really be an issue. Leave the cabin and head through the unlocked gate killing any Shadows that get in your way along the way. Pick up [Lollipops] from the infinite spawning box to York’s left and save your progress so far at the ringing payphone if you wish. The power will go out once again as you continue on down the path meaning we will need to find another generator in the area to restore it. At the faded Greenvale sign make a left to pick up a [Agent Honor (Red)] and use a generator to restore power. Backtrack back to the faded Greenvale sign and continue straight ahead. When the path splits again, head right towards the dead end to pick up an additional [Agent Honor (Red)]. 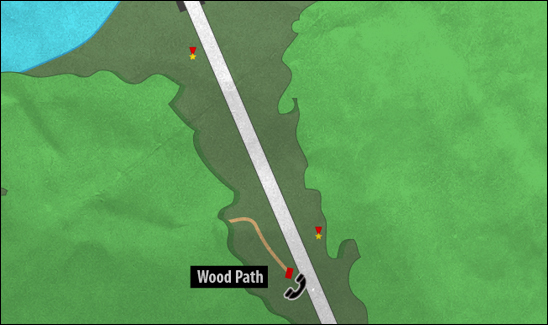 Turn around and follow the path to until you reach another open area and head inside the cabin to your left. Inside is a broken generator and a tool box you can use to leave or grab items from. If you stocked up on lollipops earlier I suggest putting some in here to open up your	inventory! Examine the broken generator in back to grab [Clue #2 Machine Broken By Axe] and pick up the undamaged [Fuse Box]. Leave the cabin and continue forward. Due to the extensive damage to the generator in the last cabin there isn’t any power running to the locked metal gate. If we want to leave we will need to find another generator in the area to restore power. Unlock the cabin to the left of the gate by shooting the lock off (you can also hit it with a melee weapon if you prefer). Inside use the undamaged [Fuse Box] you took from the previous cabin on the generator and turn it on to unlock the gate outside. Once you head through the gate and red vines will grow from the ground and prevent York from backtracking into the previous areas but don’t worry there’s nothing we need back there anyway! Once you enter a large open area search behind the blue car with license plate 69212PR stuck in a mud puddle to your right to grab another [Agent Honor (Red)]. If you continue to the right the path will only lead to a dead end with an infinite enemy spawning point. There are several boxes you can destroy for [Agent Honor (Blue)] but if you wish to avoid additional enemies I suggest you don’t head that way. To the left of the entrance are several puddles that will respawn an infinite number of enemies so don’t waste your time trying to kill them all and just run straight by them. As you near the final exit a person in a red raincoat will jump out and attack York with an axe (Hey I think we found who’s responsible that mangled generator we found earlier!). Evade the axe swing then head through the gate covered by red ivy to grab the final clue [Clue #3: Red Ivy] and leave the area. Huzzah! We’ve made it back to normal civilization! You can save your progress at the pay phone at the side of the road but it’s not really necessary as the game will automatically save for you at the chapter end occuring in just a few minutes. Cross the street and grab the [Agent Honor (Red)] next to the Greevale Nature Preserve sign then follow the road towards the red marker situated over June Bridge. Grab another [Agent Honor (Red)] near the last Greenvale Nature Preserve sign on the left side of the road then head onto June Bridge to meet Greenvale’s Deputy Sheriff Emily Wyatt and Sheriff George Woodman.